Sprout Pharmaceuticals, which won federal approval this week for its female libido pill, is being bought by Valeant Pharmaceuticals for $1 billion. The deal comes two days after Sprout received approval from the Food and Drug Administration for Addyi. Sprout describes Addyi as the "first and only" FDA-approved treatment for sexual dysfunction in premenopausal women. Valeant (VRX)is clearly hoping that Addyi will emulate the success of Viagra and become a blockbuster drug. Sprout said it will be on the market by October 17. Addyi is a treatment for hypoactive sexual desire disorder, defined by Sprout as "a persistent absence of sexual thoughts, fantasies, responsiveness and willingness to engage in sexual activity that causes personal or relationship distress." 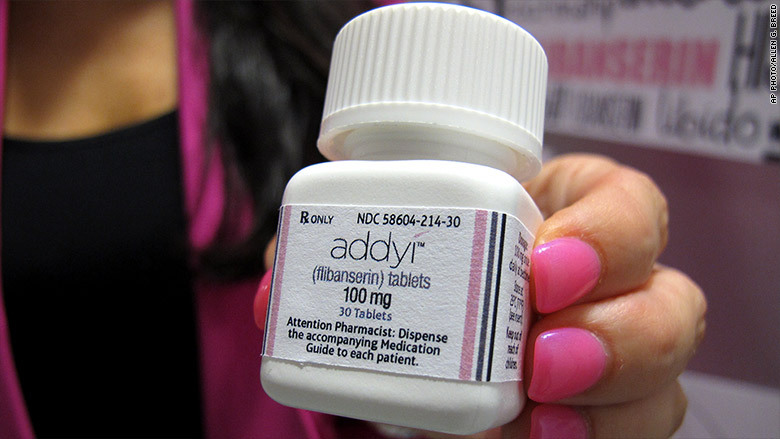 Addyi, also known as flibanserin, was studied in more than 11,000 women before it was approved. Valeant, a Canadian company, will pay $500 million in cash up front, and another $500 million after the deal closes, in the first quarter of 2016. Sprout CEO Cindy Whitehead will continue to lead the company as a division of Valeant. Valeant, which has U.S. offices in New Jersey, a hub for drug makers, has been buying up companies. It acquired Salix Pharmaceuticals in April, Solta Holdings last year, and Bausch & Lomb Holdings in 2013.